SPACE STATION NATHAN: FRANKENSTEIN is on the loose today! He's out! He's finally out! 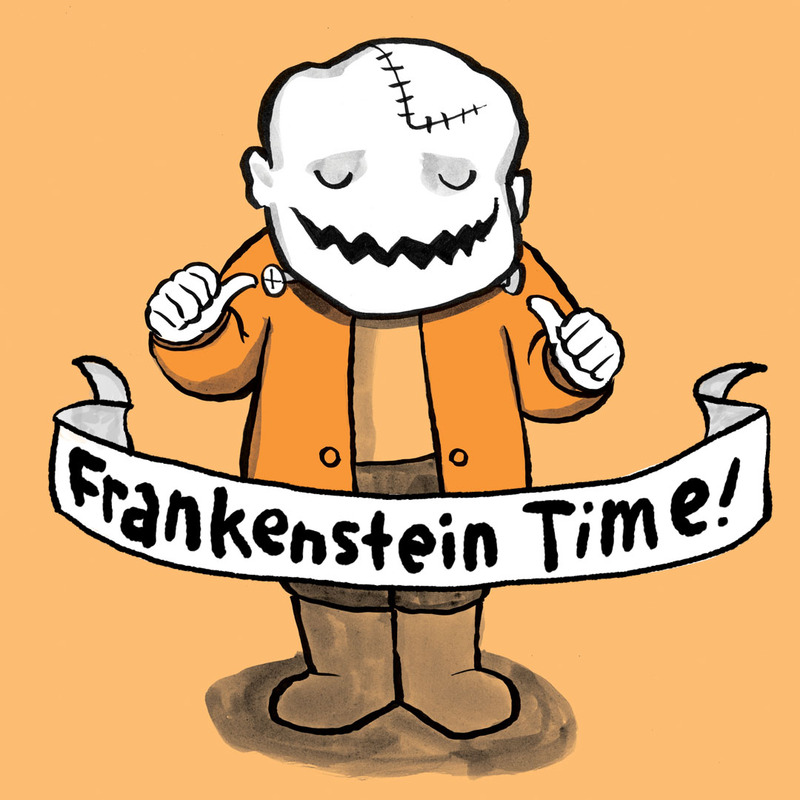 Frankenstein, the Madeline spoof written by Rick Walton and illustrated by me, is out today! In stores, online, wherever you buy books! We were planning on celebrating by posting an all new picture book parody here today, but we decided there just wasn't enough FRANKENSTEIN in that. This week needs more FRANKENSTEIN! So, the game is: What Would You Like on Your Frankenstein? Here is how it's played: For the next two weeks, I will be drawing Franky, here, in different outfits/scenarios/you-name-it. Leave your comment each day, letting me know what you would like on your Frankenstein (ex: I want to see Frankenstein riding an ostrich, or Frankenstein in a sombrero, etc.) author Rick Walton will pick the winning comment, and I will draw it! At the end, we should have a bunch of cute/menacing/ugly little Frankensteins. So let's play. What would you like on your Frankenstein? I would like to see Frankenstein dressed as a Wiggle. Or have him look like Rick. I have this wonderful mental image of Frankenstein in a little sailor suit with a giant lollipop (and looking none too pleased). Frankenstein at a tea party. With doilies. I'm picturing Gene Simmons-esque with bat wings. heh. Frankenstein in Atlantas, meeting a few of the merfolk. Frankenstein on Rye, cheese, lettuce, pickles, hold the mayo. With a side of fries. Wow. These are all hilarious. I can't wait to see what Rick picks. Frankenstein jumpng rope with a banana. My copy of Frankenstein arrived today! Yay! It's awesome! I would like to see Frankenstein dressed in a BYU football uniform. Please. Frankenstein at a movie theater munching on popcorn and enjoying a feauture film about himself. frankenstein raising awareness for organ donation charities? i really wonder why nobody has tried that before. Frankenstien dressed up as Madeline, with the dress and hat and everything.